Barring a "catastrophic development," Middle East Newsline reports, George Bush has decided not to attack Iran. An administration source explains that Washington deems Iran's cooperation "needed for a withdrawal [of U.S. forces] from Iraq." If correct, this implies the Jewish state stands alone against a regime that threatens to "wipe Israel off the map" and is building the nuclear weapons to do so. Israeli leaders are hinting that their patience is running out; Deputy Prime Minister Shaul Mofaz just warned that "diplomatic efforts should bear results by the end of 2007." Can the Israel Defense Forces in fact disrupt Iran's nuclear program? Top secret analyses from intelligence agencies normally reply to such a question. But talented outsiders, using open sources, can also try their hand. Whitney Raas and Austin Long studied this problem at the Massachusetts Institute of Technology and published their impressive analysis, "Osirak Redux? Assessing Israeli Capabilities to Destroy Iranian Nuclear Facilities," in the journal International Security. 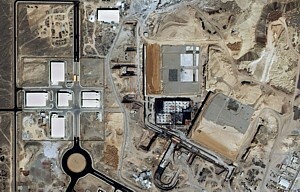 The Natanz uranium enrichment facility. Intelligence: To impede the production of fissile material requires incapacitating only three facilities of Iran's nuclear infrastructure. In ascending order of importance, these are: the heavy water plant and plutonium production reactors under construction at Arak, a uranium conversion facility in Isfahan, and a uranium enrichment facility at Natanz. Destroying the Natanz facility in particular, they note, "is critical to impeding Iran's progress toward nuclearization." Ordnance: To damage all three facilities with reasonable confidence requires – given their size, their being underground, the weapons available to the Israeli forces, and other factors – twenty-four 5,000-lb. weapons and twenty-four 2,000-lb. weapons. 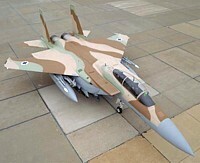 Platforms: Noting the "odd amalgamation of technologies" available to the Iranians and the limitations of their fighter planes and ground defenses to stand up to the high-tech Israeli air force, Raas-Long calculate that the IDF needs a relatively small strike package of twenty-five F-15Is and twenty-five F-16Is. Routes: Israeli jets can reach their targets via three paths: Turkey to the north, Jordan and Iraq in the middle, or Saudi Arabia to the south. In terms of fuel and cargo, the distances in all three cases are manageable. Defense forces: Rather than predict the outcome of an Israeli-Iranian confrontation, the authors calculate how many out of the 50 Israeli planes would have to reach their three targets for the operation to succeed. They figure 24 planes must reach Natanz, 6 to Isfahan, and 5 to Arak, or 35 all together. Turned around, that means the Iranian defenders minimally must stop 16 of 50 planes, or one-third of the strike force. The authors consider this attrition rate "considerable" for Natanz and "almost unimaginable" for the other two targets. In all, Raas-Long find that the relentless modernization of Israel's air force gives it "the capability to destroy even well-hardened targets in Iran with some degree of confidence." Comparing an Iranian operation to Israel's 1981 attack on Iraq's Osirak nuclear reactor, which was a complete success, they find this one "would appear to be no more risky" than the earlier one. Raas-Long imply but do not state that the IDF could reach Kharg Island, through which over 90 percent of Iranian oil is exported, heavily damaging the Iranian economy. That Israeli forces have "a reasonable chance of success" unilaterally to destroy key Iranian nuclear facilities could help deter Tehran from proceeding with its weapon program. The Raas-Long study, therefore, makes a diplomatic deal more likely. Its results deserve the widest possible dissemination. Mr. Pipes (www.DanielPipes.org), director of the Middle East Forum, taught for two years at the U.S. Naval War College. Nov. 2, 2007 update: Aviation Week looks in detail at the Sep. 6 Israel mission to destroy a site in northern Syria; it certainly confirms the Israeli technical prowess assumed in the above analysis. A military strike by Israel against Iranian Nuclear Facilities is possible and the optimum route would be along the Syrian-Turkish border then over a small portion of Iraq then into Iran, and back the same route. However, the number of aircraft required, refueling along the way and getting to the targets without being detected or intercepted would be complex and high risk and would lack any assurances that the overall mission will have a high success rate. Long-range bombers. Israel has purchased premier U.S. fighters especially configured for the buyer's specific threats — read, Iran. The more than 100 F-15I Ra'ams and F-16I Sufas are equipped with special extended-range fuel tanks. Augmenting the supersonic strike jets is Israel's perfection of aerial refueling from B-707 tankers. Armaments. Israel's innovative avionics industry is fitting the jets with a new bomb-guidance system that can find intended targets easier. The defense force now owns scores of BLUs — the military acronym for "bomb, live unit," which is also known as powerful "bunker buster" bombs capable of penetrating underground or hardened facilities. Intelligence. Israel now has in orbit a fleet of super-spy satellites, such as the Ofek-7 launched in 2007, that can regularly capture images of Iran's nuclear and defense sites for the air force's target list. With such constant satellite coverage, it is a safe assumption that war planners have studied Iran's high-value facilities and have a tactic for how to strike each one. Israel has added expertise in analyzing such sites since it produces atomic weapons. "We might be able to do it with 20 B-2s with 200 bombs apiece. Four thousand bombs," said Col. Warden. "Maybe that would do it. I don't know. If you could get to them, how deep are they buried and whether you know where the darn things are." The only sure way to stop it is draconian. ... if the United States wanted to absolutely ensure the Iranians could not build a nuclear arsenal, planners might opt to shut down all sources of power generation. "Iran cannot sustain a nuclear research program if they don't have electricity and oil and a bunch of other things like that," Col. Warden said. "But that is a pretty draconian solution. We have the capability to do that. We could do that in 24 hours if we wanted to. But nobody else in the world is remotely close to being able to do it. And we wouldn't." John Pike, a longtime analyst of the Pentagon and intelligence agencies, has a different view on Israel's capability. He says the overt side of Iran's program — facilities at Esfahan, Natanz and Qom, for example — represents the bulk of its atomic work, which includes enriching uranium and creating components for the actual bomb. "Iran requires 100 percent of its program in order to build a bomb," said Mr. Pike, founder and director of GlobalSecurity.org. "There do not seem to be any 'spare' or duplicate facilities. Israel does not need to destroy 100 percent of Iran's infrastructure to disable the program. Israel only needs to disable a big chunk of the program, which would render the remainder worthless. The major facilities are isolated, so there is not much danger of significant civilian casualties." Mr. Pike said Israel might be considering another target: the nuclear workers and scientists themselves. "Most of the people who work at these facilities live in housing that is more or less co-located with the facility," he said. "This makes for a short commute, and facilitates physical and operational security. Bomb the housing, and you destroy the program for a generation." Dec. 14, 2011 update: It's not generally realized, but the complete military withdrawal of U.S. forces from Iraq means the country's airspace will be basically open for at least a year, either to Israeli planes flying to Iran or the reverse, until the Iraqi air force is up to par. Presumably this fact reduces the obstacles to an Israeli strike against Iranian nuclear facilities. Such an attack would require the capability to reach and destroy distant targets, while overcoming aerial defense systems. Yet the number of facilities that would need to be hit to deal a significant blow to Iran's nuclear infrastructure is generally overestimated. … At a time when appeasing Iran seems to be in vogue, an Israeli strike could invigorate elements in the international arena who are unwilling to accept an Iran with a nuclear breakout capability. In addition, many people around the world would be reminded that muscular reactions to evil regimes are often truly necessary. A decision by Israel to strike Iran would be a historic gamble. Nevertheless, history, necessity, and common sense point toward an attack. Related Topics: Iran, Israel & Zionism | Daniel Pipes receive the latest by email: subscribe to the free mef mailing list This text may be reposted or forwarded so long as it is presented as an integral whole with complete and accurate information provided about its author, date, place of publication, and original URL.